I’m wiped out. It was a super busy weekend. I feel great because we got a number of things scratched off the old to-do list. More furniture work- a cedar chest and adorable chair are on their way to joining our little reuse-renew-recycle collection. I am possessed. I have gone to the hot crazy place. I have baby fever. For the record I have never had baby fever before. I have never wanted a baby like I want one now. I haz the baby rabies. There is something so final, and sad, about being finished making and nursing babies- which I have done non-stop for the last 6 years. My identity is so deeply tied to this stage of my life. College lasted only 4 years, grad school 2, I only worked for 2.5 after that. The ONLY thing I have been a part of longer is my marriage (love you, babe). Who will I be if not an incubator? I’m not deeply in love with pregnancy, not am I thrilled to nurse my babies for 12 months. I’m not even that worried about my ever-evolving identity…. But that thing brand new babies do when you pick them up? That thing where they arch their back and stick out their tiny little butts? Love it! When they sleep on your chest, which they do all the time, and they feel so warm, and you feel warm. And it doesn’t matter that dishes are dirty and the laundry isn’t folded because you could just look at that face for hours on end. That. Sleeping babies make these noises. Little sleep apnea squeaks and stretches and groans. And while they are sleeping on you, lean down and take a whiff of that new baby smell? Delicious. I realize I still have a baby. But honestly she seems more like a little person, filled with her own hilarious personality. Sometimes I need to see how far we’ve come. It’s easy to see the flaws, the projects that are unfinished, the problems this house still has. But when I start to focus on that too much I’m going to make myself look at the “before” pictures. When we hadn’t even purchased the place. When it was still dirty and standing unoccupied. The difference is quite striking. 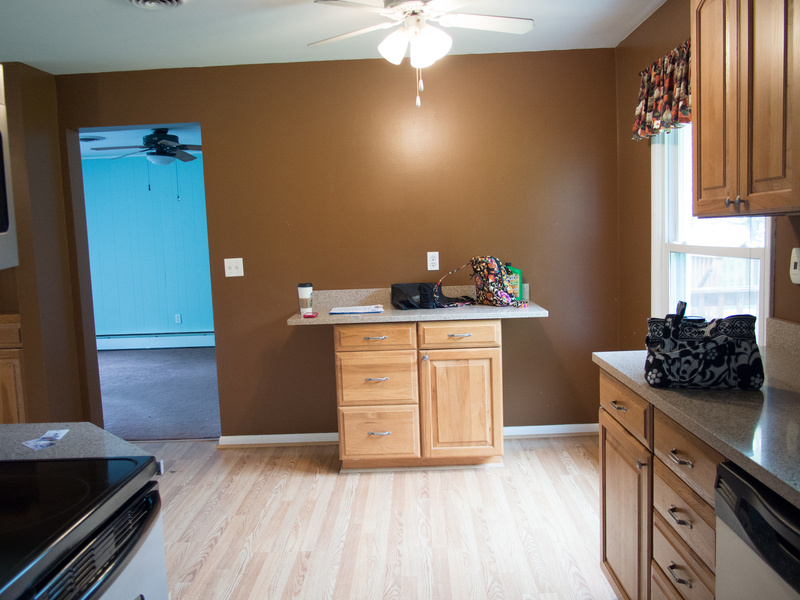 October 2012: pergo floors, oddly placed counter top space, dark walls, and I don’t even want to tell you how dirty the ceiling fan was. December 2012: construction, cleaning, progress. 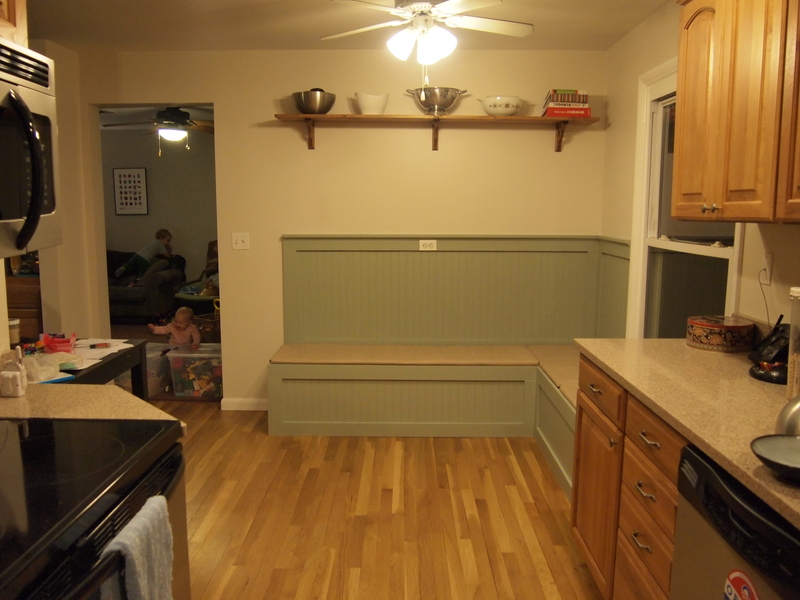 January 2013: paint, seating, storage, and a place for a dining room table. February 2013: progress! I can see what still needs to be done, but instead I’m going to marvel at the transformation. 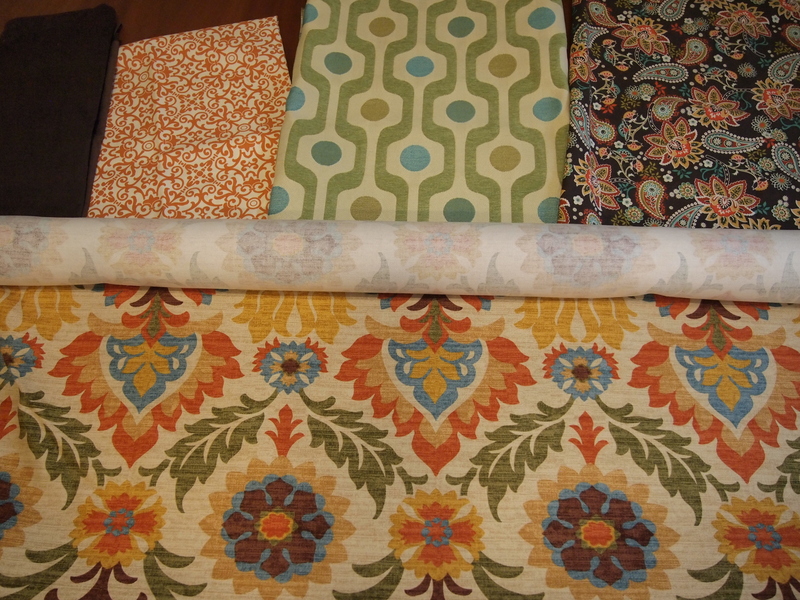 Here is a peak at the fabric palate. Does it look vibrant and fun? I sure hope so! Money is tight. What are you going to do? 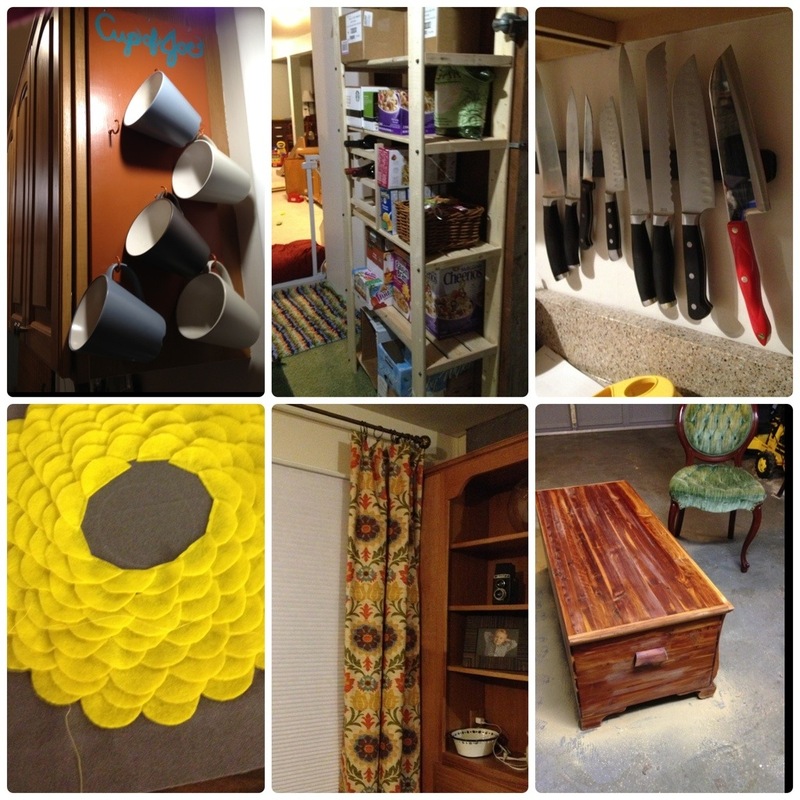 Sell old stuff on Craig’s List and use the money to buy more functional furniture, of course! There is nothing wrong with the black media cabinet, but we didn’t have one for the downstairs TV (it was literally sitting on the floor). 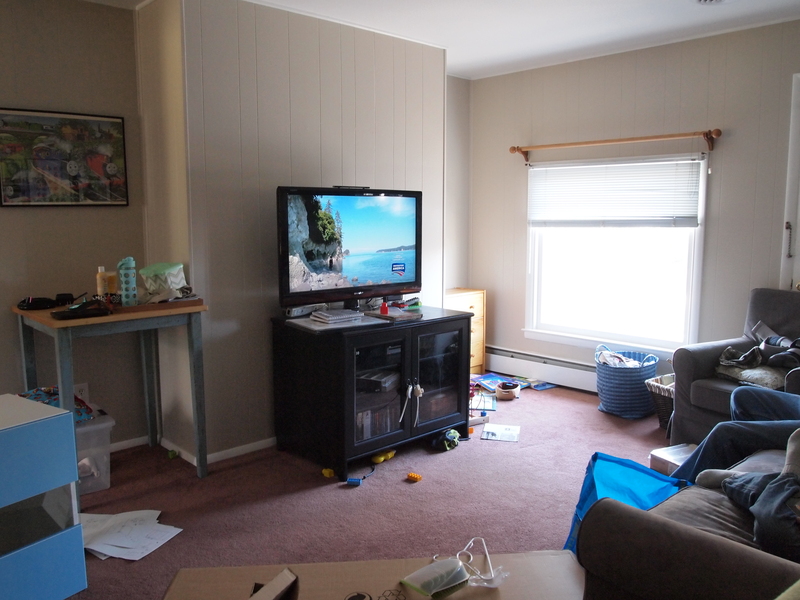 Instead of get something new for the rec room we decided to get something a little shallower and better fitted to the TV wall for the playroom. Then there is the question of the bistro style table. While I will not deny the importance of having a place for my coffee that is out-of-the-way, it doesn’t store anything, and honestly, the size of the table top lead to an awful lot of piles on top of piles. A thrifty Craig’s List find of my own (bookcase) and a trip to Ikea (TV unit) and we are good to go. Bonus: It’s revenue neutral. Hah! Too bad I forgot to buy the legs for the TV unit while I was there. Silly me! 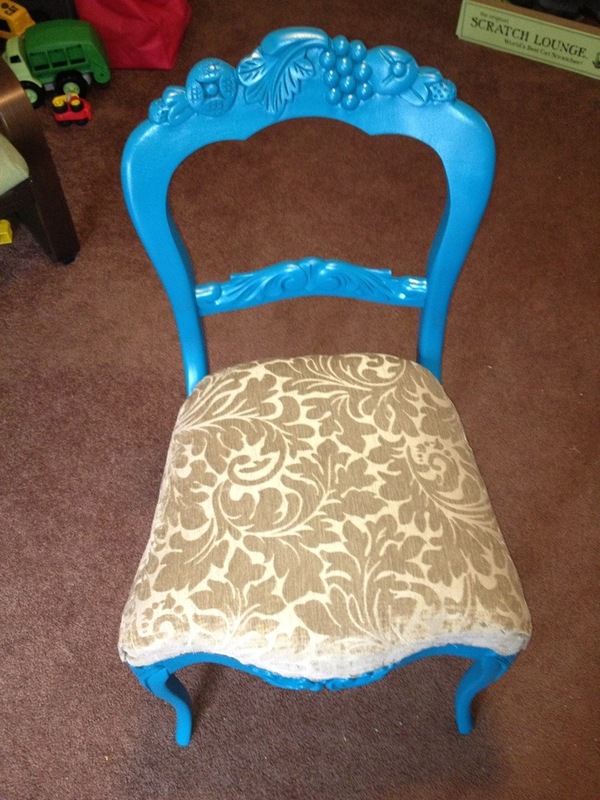 I got this fab chair free from a friend and used this spray paint tutorial. 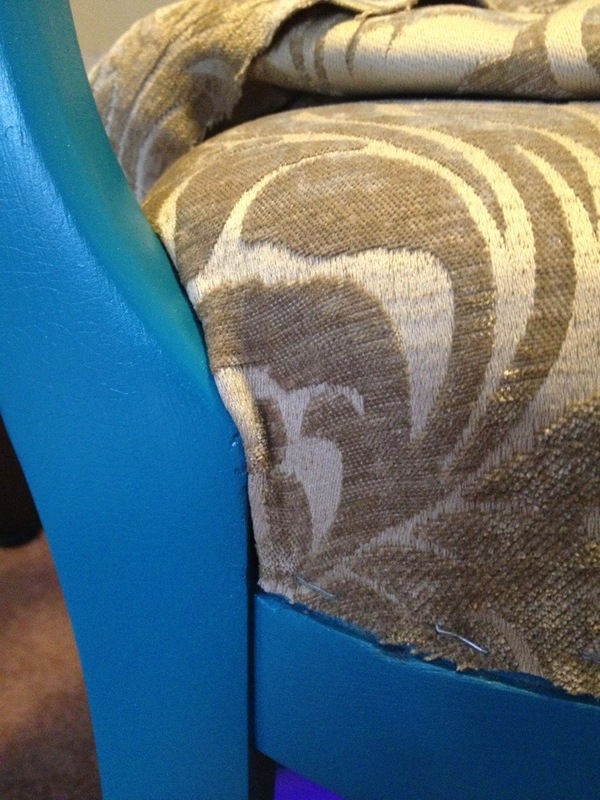 But when it came time for the upholstery… I just fudged it. The first thing you do is pull off a few layers of fabric! It’s the scariest part, because its permanent- but you have to do it. 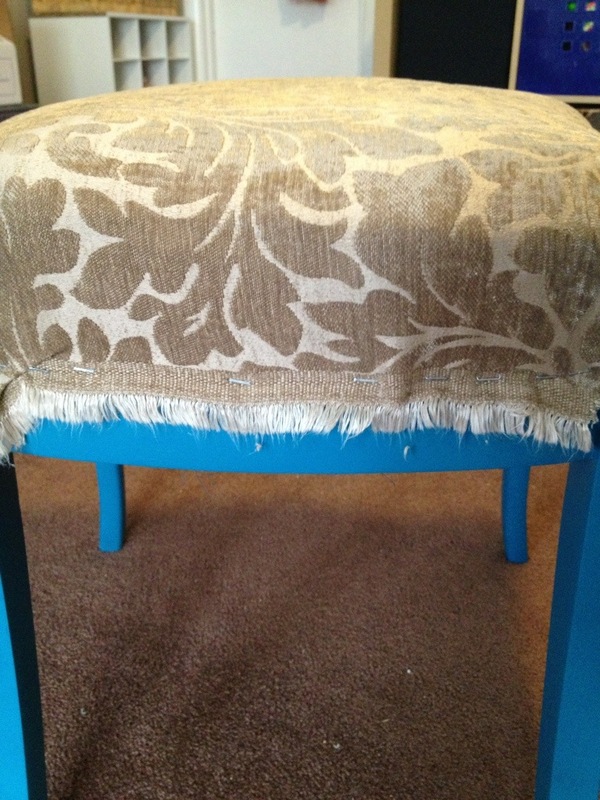 Layering fabrics on top of other fabric makes it bunch and lay weird. 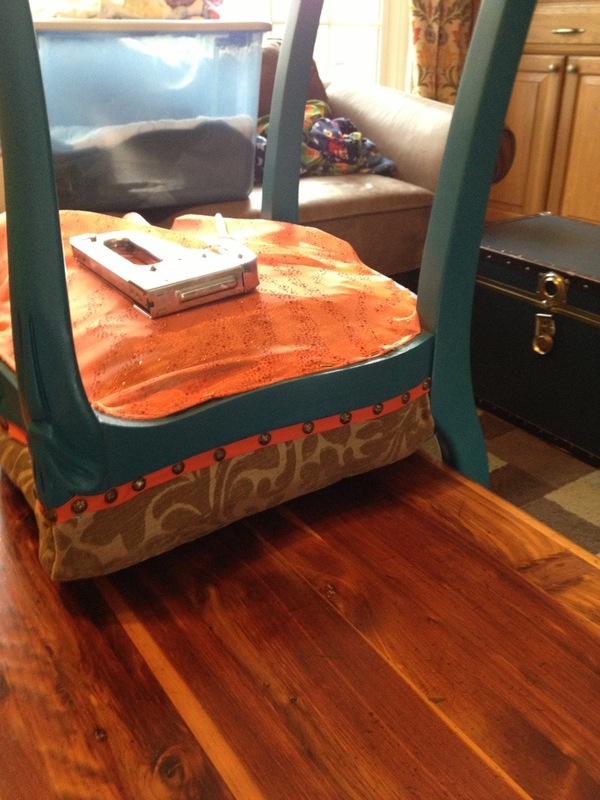 Here’s the chair, nearly finished. 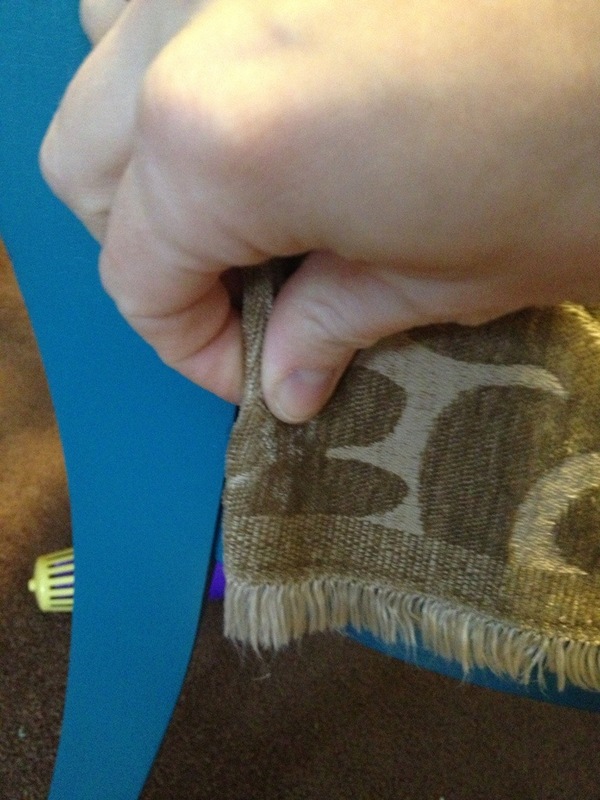 I started by finding the manufacturer’s edge of the fabric. This allows an outside edge to be even. 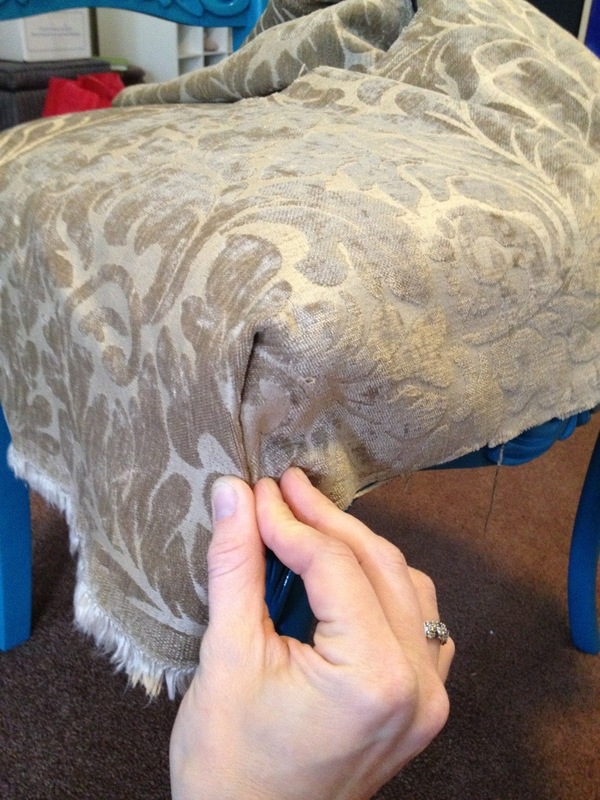 I chose a fabric pattern that doesn’t need to be centered but stripes, plaids, and some florals need to be centered on the cushion. I stapled the back edge first. I started IN THE CENTER. Placing one staple to the right of center and then left. I pulled the fabric tight, but not tight like a drum, like a fitted sheet, snug- not snare. Before setting the first stable experiment with how tight you want the fabric from back to front. Work out in both directions simultaneously. Then you have to do the sides. Play with how tight the fabric is. Set 2 staples in one side, then two in the other. Moving back and forth until you are 3 inches from the corner. 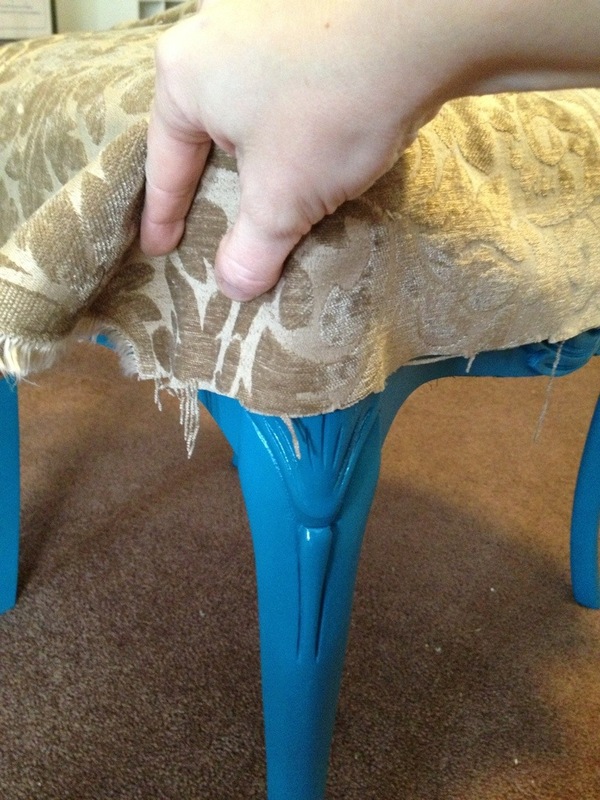 Remember you can always pull out a staple- grab a butter knife- and re-do if the need arises. 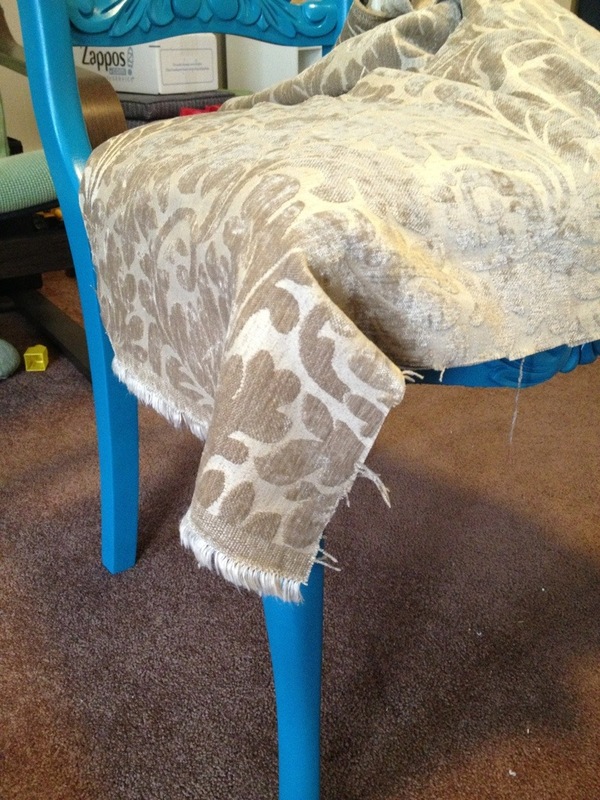 The first step is to tuck the fabric under. To hold it there you will set 1 or 2 staples near my index finger. 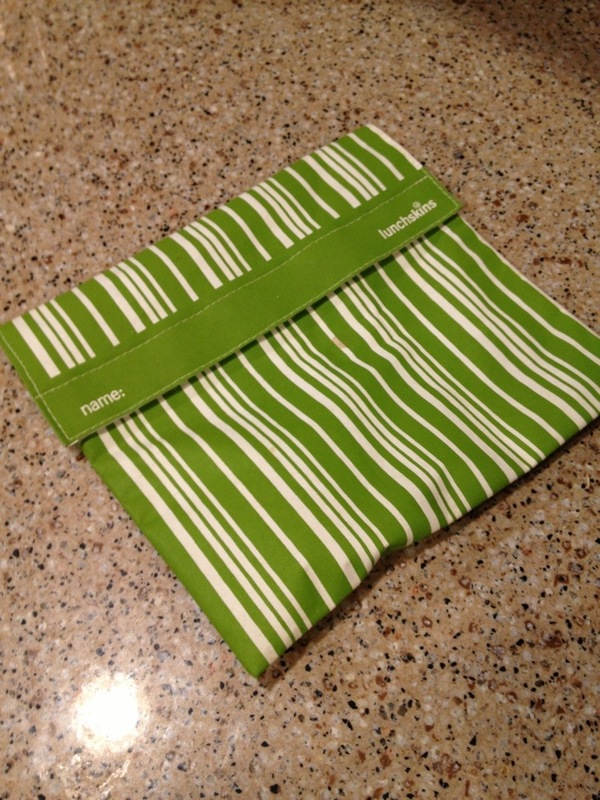 Then you can fold the top over, leaving a crease right in the corner. You will need to set a few staples to hold it in place. Then repeat this process on the other front corner. The back corners are a horse of a different color. Luckily they were a piece if cake! I just folded the fabric over on itself and stapled. As you can see the edge isn’t finished. 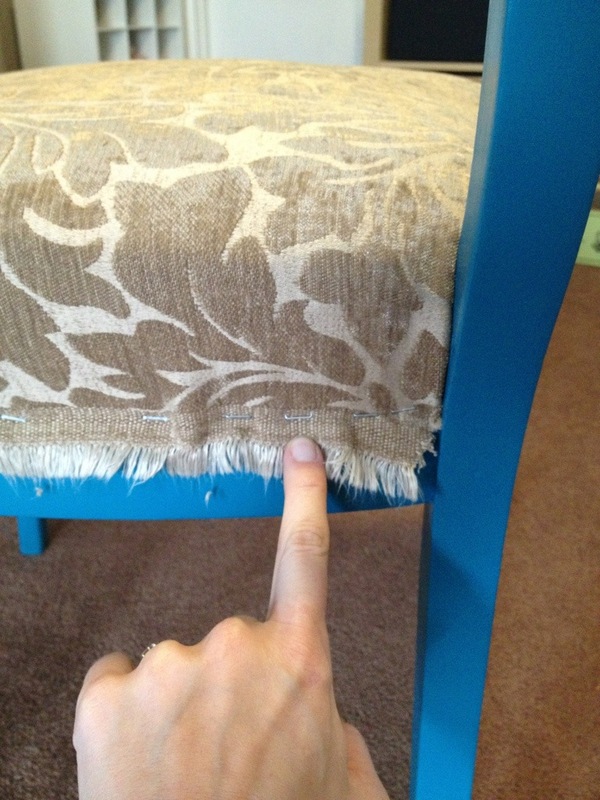 I will need edging and upholstery nails from my local fabric store. I’m getting that tomorrow. Luckily it will cost me less than $5 for both items! I will leave you with this exciting before and after. The best part? 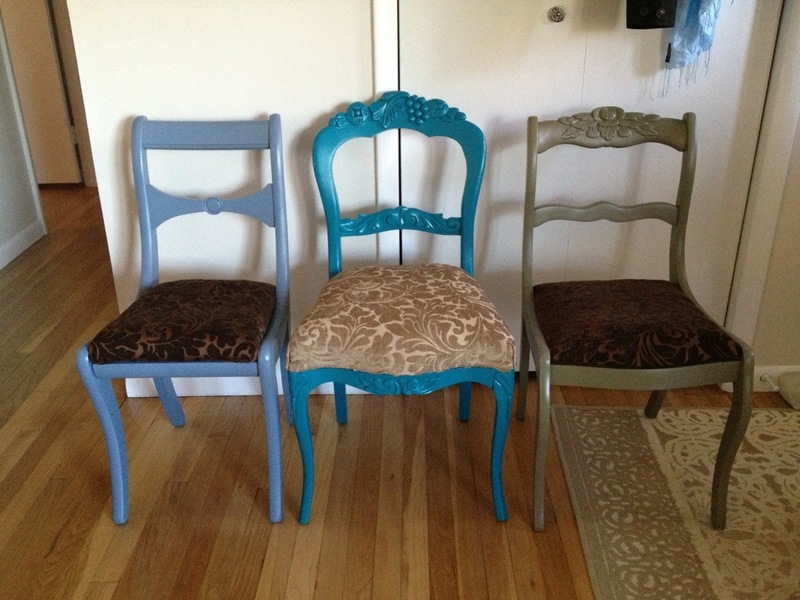 This cost me $4 per chair! 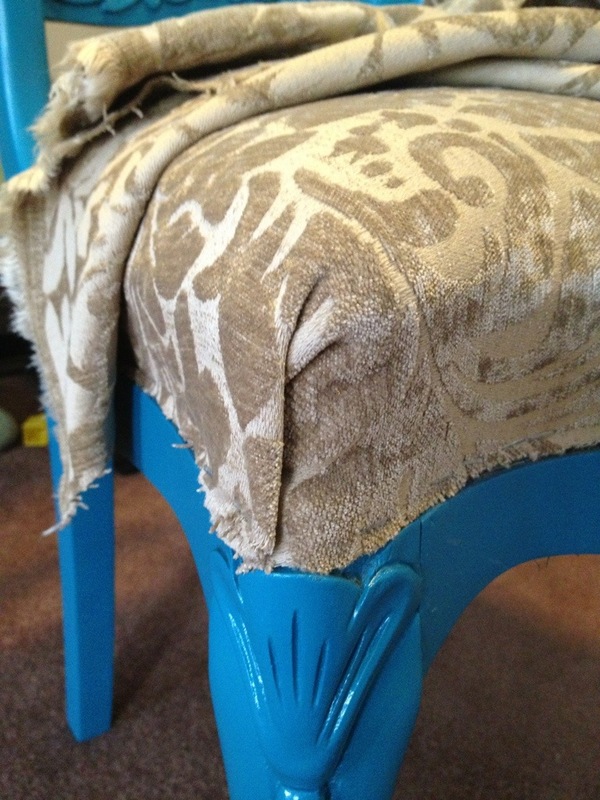 The chairs were free, the upholstery fabric I already had (I snagged it out of the remnant bin 2 years ago), we had the sand paper. All we paid for was a can of spray paint each! 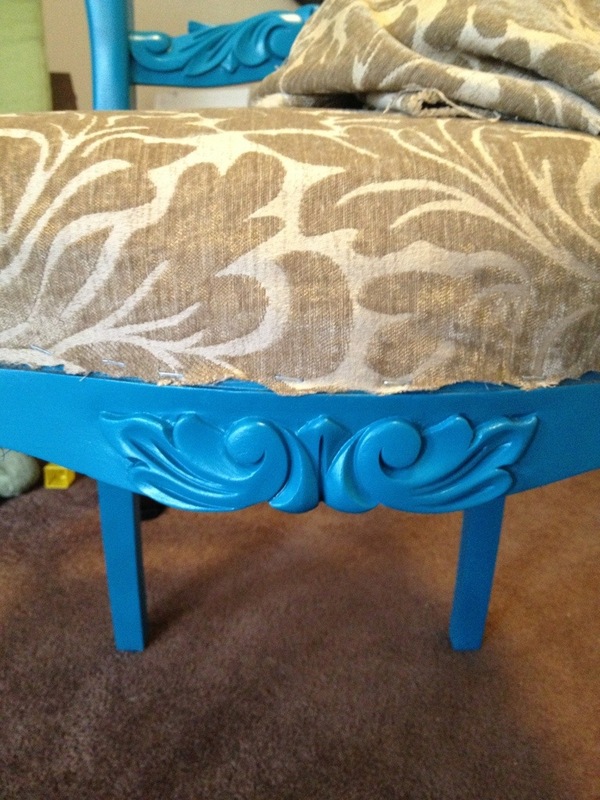 For a great tutorial see Young House Love- those kids really know their spray paint! You know that thing when you take on too much? I have underestimated how challenging it would be to move with small children, in the winter, right before Christmas. 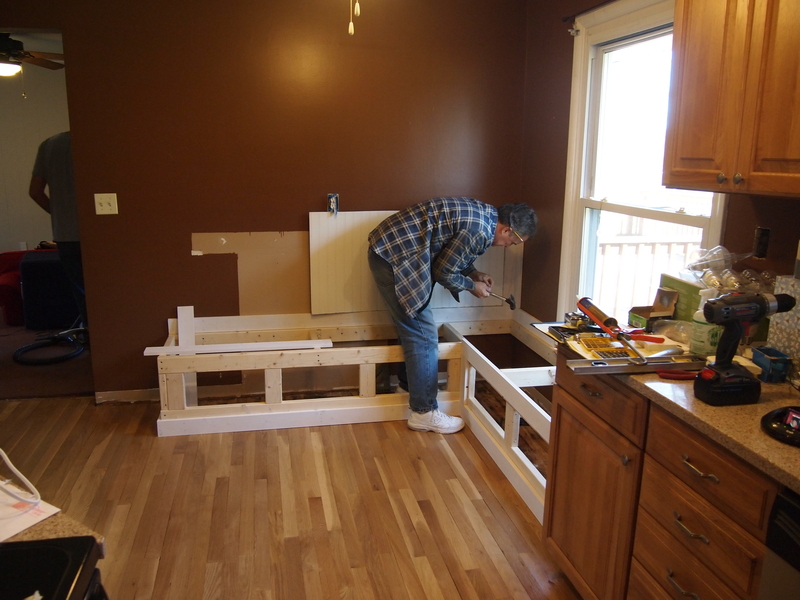 We have lots of little projects going on. The Handy Husband has his own list, I have mine. In order to best do these projects we need to be better organized (so we can find tools, so we best use our time throughout the day, and so I don’t spend 20 minutes every morning searching for sunglasses or swimsuits or school bags). 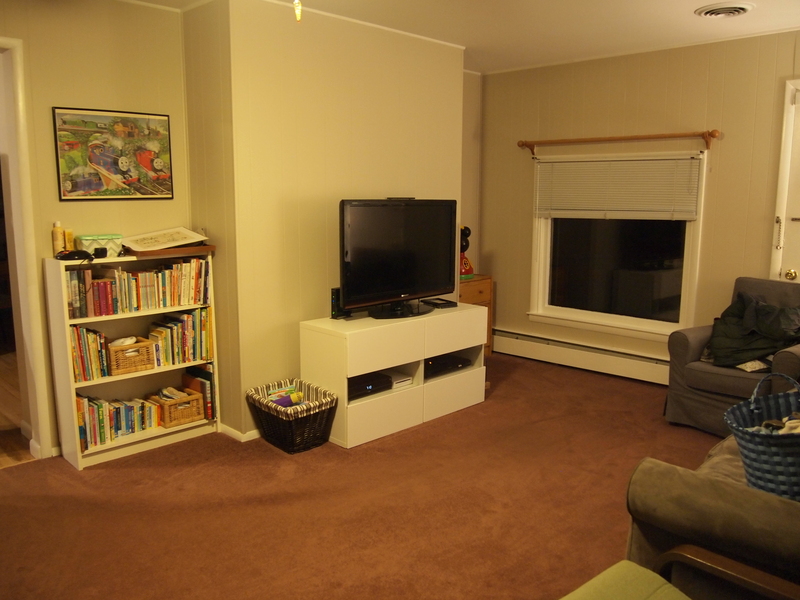 In the townhouse we had less space and therefor used it most effectively. We haven’t even been here two months but it feels longer than that, because we have managed to do so much and there have been holidays and a new year. It’s because of that time discrepancy that I feel I am falling short. There are days where I can’t find a screwdriver, like, at all. Sometimes I open every. single. drawer. before I manage to find my pants. 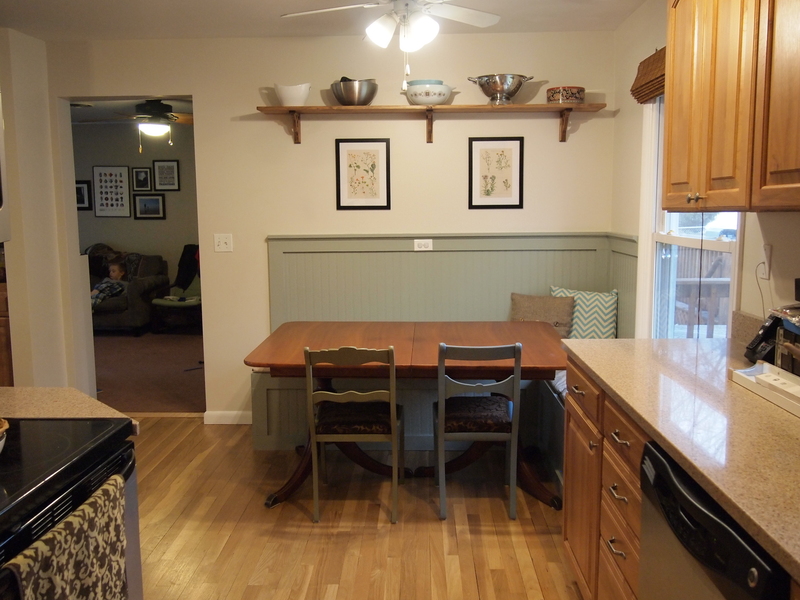 I don’t want to get into how much I miss my old kitchen… so much space. I tried to bake cookies and had to open everything to find the baking soda- very frustrating. But in the end the cookies were baked. I find myself inventing errands to run as a means of escaping my house for a few hours. Let me tell you, running errands with three kids is no picnic. So things might be a little desperate. In order to justify all this errant errand-running I take on more projects. Which leads to more half-stitched pillows and un-hung curtain rods and un-sprayed paint. King sized bed (somehow we end up with someone joining us more often than not). 1. I make my own lotion, antibiotic ointment, diaper cream. 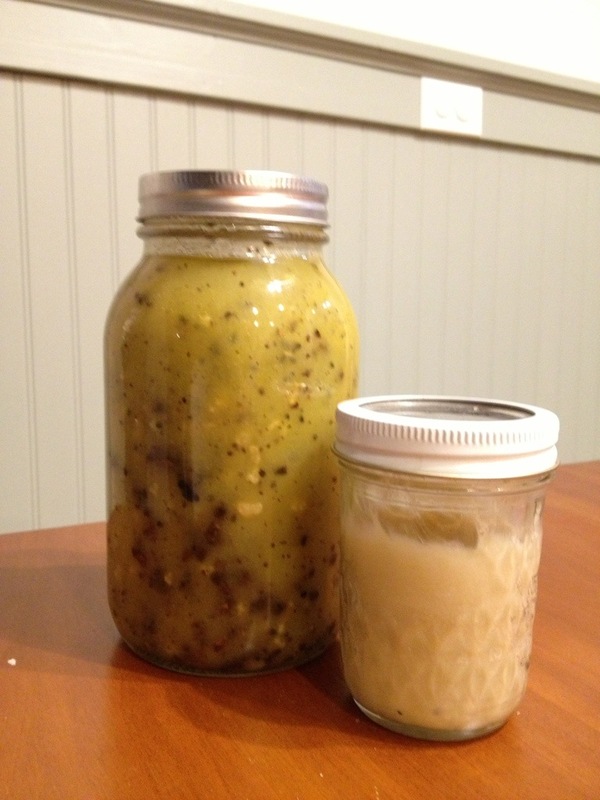 This is the finished product in front and some herbs infusing in oil to later become ointment. 2. 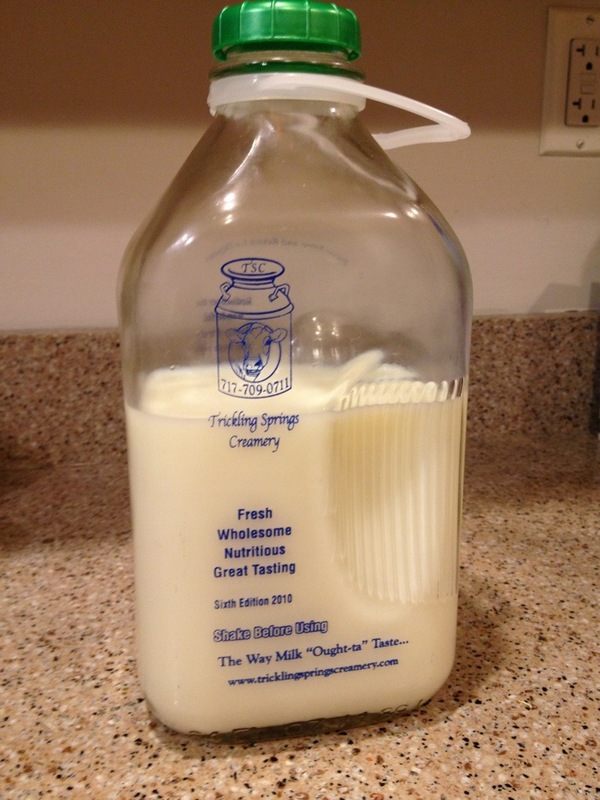 The milk we drink comes in glass jars, from a local group of dairy farmers. It is low-temp pasteurized. I am curious about raw milk but unsure I will appreciate the texture of whole milk. 3. We use reusable ziplock bags for times when we don’t need an air-right seal. Always thinking about the green. 4. 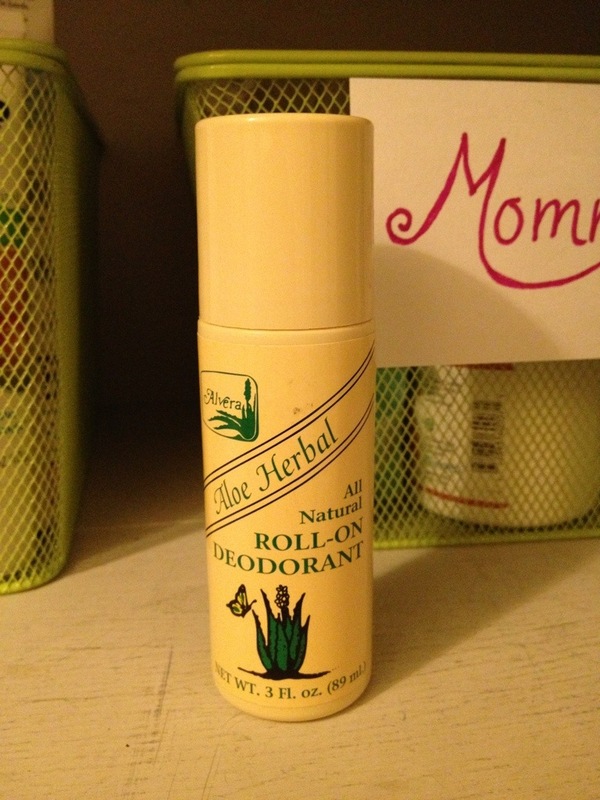 I use a natural deodorant. 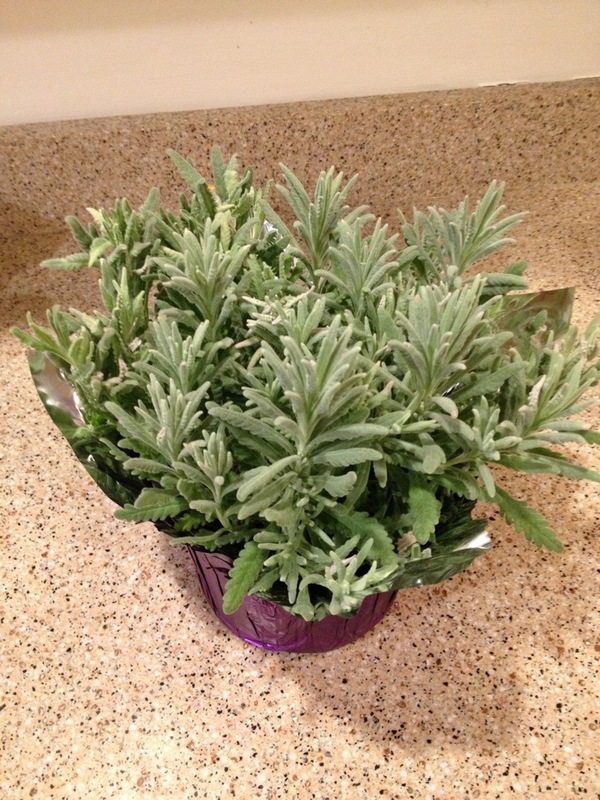 I have had a hard time finding something that I like the smell of, something that doesn’t smell artificial and yet isn’t completely ineffective. I really appreciate this healthy alternative and it works right along side my natural and vegan make up. (I have yet to find a waterproof mascara that I find to be rave-worthy). 5. This stuff is seriously amazing. 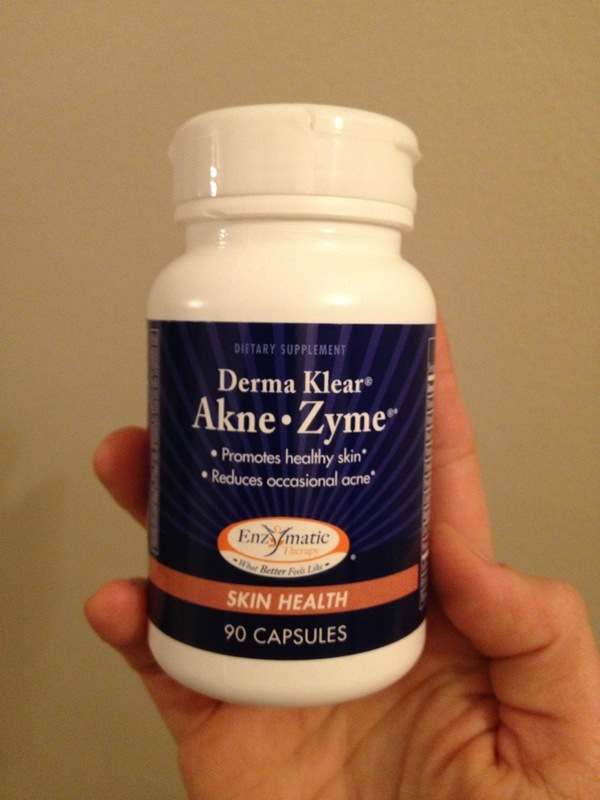 I use it to treat my acne/zits. I was tired of having zits well into my 20s and I was frustrated that they all seemed to be deep in my skin so they throbbed with pain. I only had one or two at a time but they were just awful. I went to a local health store and the nutritionist told me that those deep zits are caused by imbalances in the body more than dirt on the skin. The difference was so quick and so obvious I haven’t looked back. The reason I am most excited about our move out here to greener pastures, is the opportunity to expand our home garden. We did several things with the tiny garden behind the townhouse but were always short on space and sunlight (it was often shadowed). 7. Glass food storage. 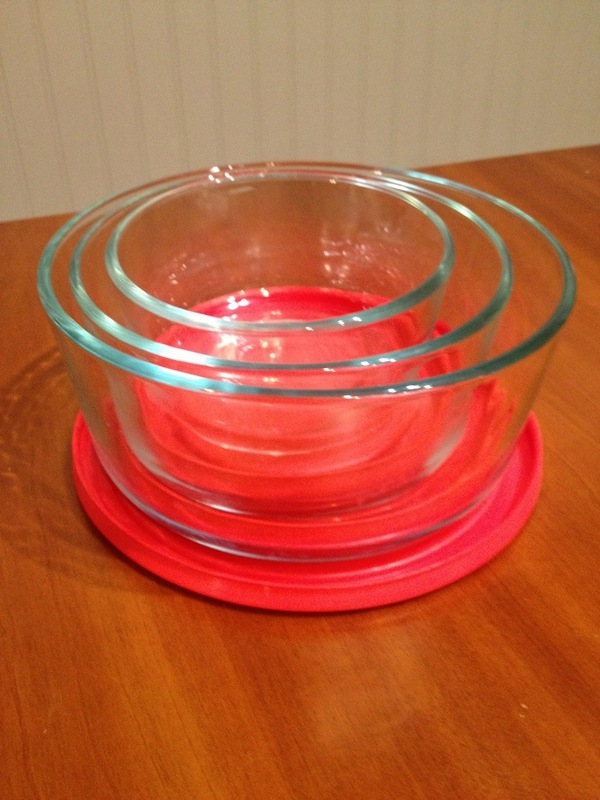 We are moving to cast iron and ceramic cookware but have long used glass to store our leftovers. Someday soon I will start to phase out our microwave use, but that will take a bit of time because I’m not very organized right now. I know you’re counting and that is only seven things. What is number eight? 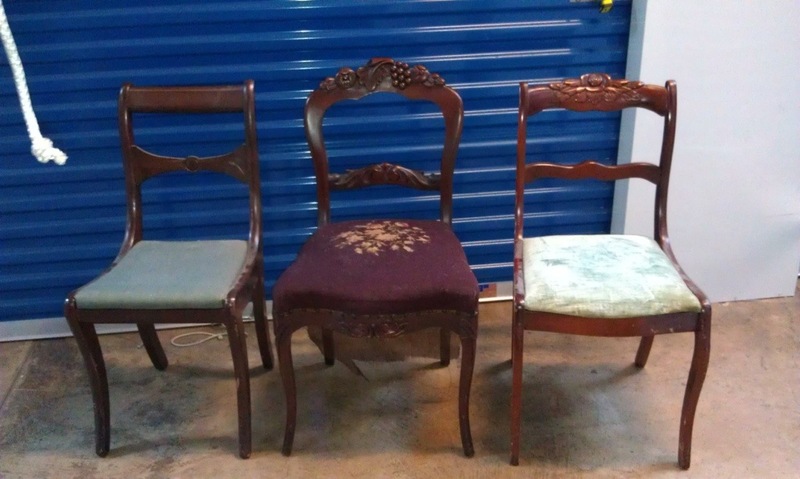 I will call number 8 our ‘reusables’. Everything from paper towels, to diapers, to Tree Hugger pads and the Diva Cup are reusables in this house. If you want to I encourage you to google the benefits of cloth ‘women’s’ items like those I’ve listed. I honestly thought the transition would be gross, and I would run screaming back to disposables, but the difference is tremendous. So we will call number 8: The Reusables. And leave it at that. I encourage you to stay tuned to next week’s: Eight normal things I use, despite my tendency to hug trees. 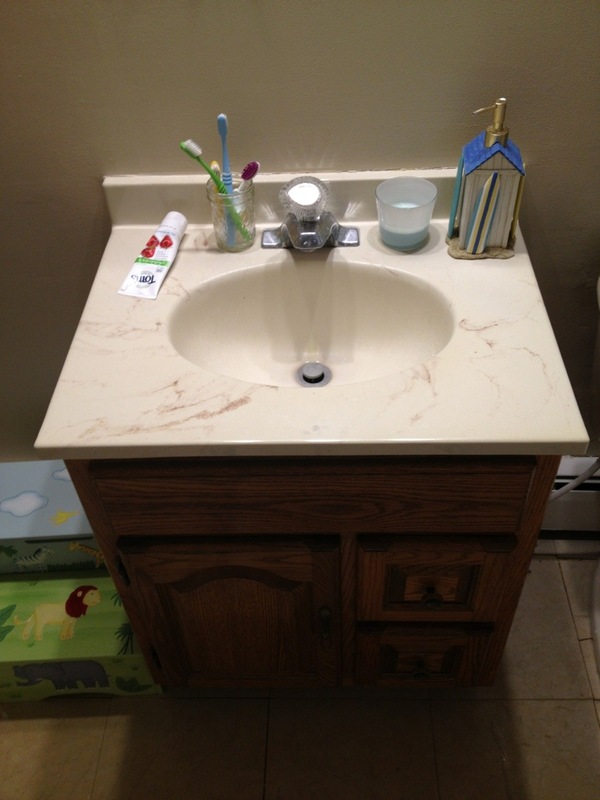 If the only bathroom sink is this big, then storage is a matter of survival. 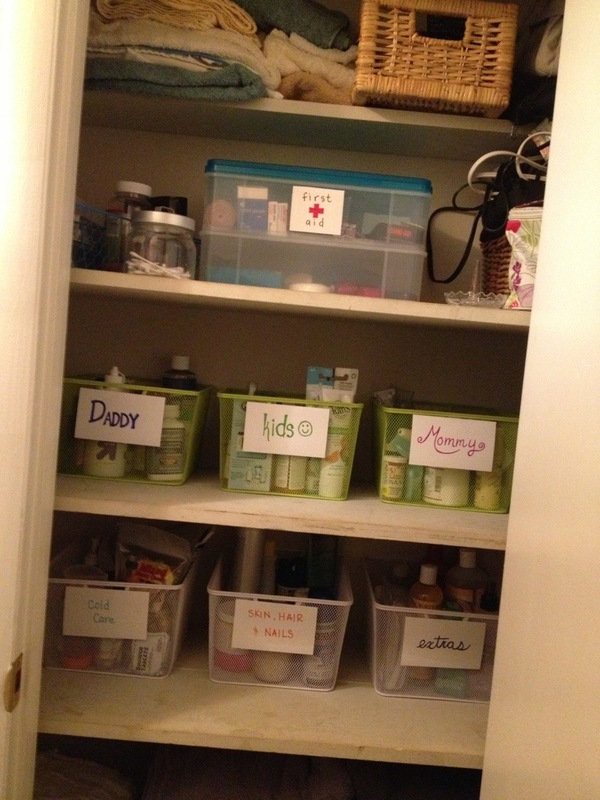 It may require creative linen closet solutions.